Hi it's Christine here at Magenta, I have some cards which have been made using photographic paper and distress oxide inks. For this technique you put some distress oxide ink on your craft mat, spritz with a little water and pick up the colour on the photo paper. When it dries the ink will look a little powdery, but when you use a baby wipe over the surface the bright colours show through. As you layer the colours it's the last layer that shows through. 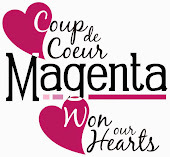 Bonjour c'est Christine ici à Magenta, j'ai quelques cartes qui ont été faites en utilisant du papier photographique et des encres Distress Oxide. Pour cette technique, vous devez mettre un peu d’encre à base Distress Oxide sur votre tapis, vaporiser avec un peu d’eau et relever la couleur sur le papier photo. Une fois sèche, l'encre paraîtra un peu poudrée, mais lorsque vous utilisez une lingette de bébé, essuyez-le sur la surface pour laisser voir les couleurs vives. Au fur et à mesure que vous couchez les couleurs, c'est la dernière couche visible. 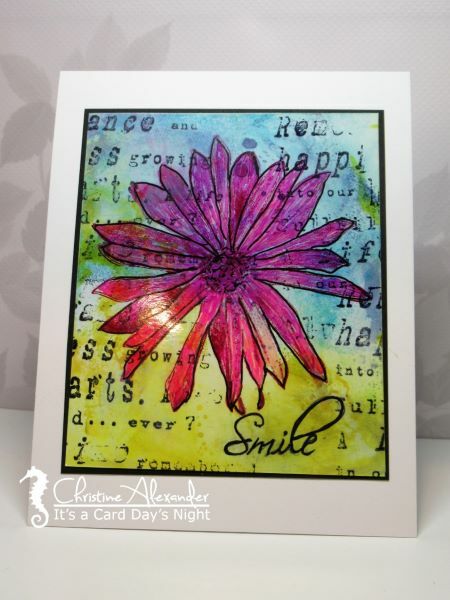 For the daisy card I coloured the flower using alcohol ink pens and re-outlined the flower with a black pen to make is pop. Pour la carte de marguerite, j'ai coloré la fleur à l'aide de stylos à encre à base d'alcool et j'ai redéfini le contour de la fleur avec un stylo noir pour créer un style pop. The card below card started out with a lot of black but as more colour was added the black disappeared. La carte ci-dessous a commencé avec beaucoup de noir, mais au fur et à mesure de l'ajout de couleur, le noir a disparu. 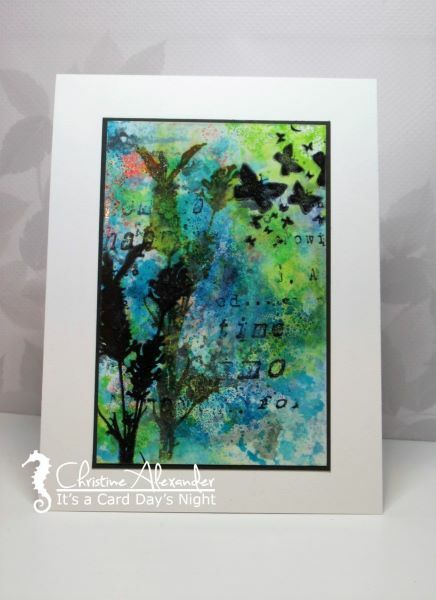 Three beautiful cards with this fantastic background technique, Christine! The colours really shine brightly using a baby wipe to clean off the bloom of the DOX inks. Great results with your background technique! Love the three different images you used on the cards and how you achieved three different looks. Well, that's cool! 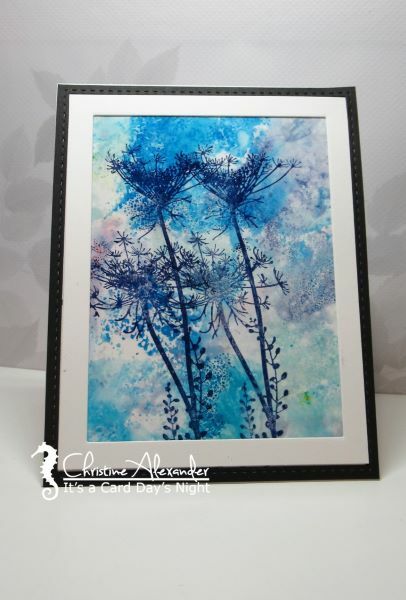 I've had some photo paper sitting out to use with alcohol inks someday, but I may have to try this, too. You always have the most interesting ideas!